Galaxy Guitar Products USA was Founded in 1996 in Oceanside Long Island New York as an enthusiastic adventure of Hard Rock Guitarist Randy Young. For 23 years Galaxy Guitar Products USA has been providing unique guitars & accessories world wide. 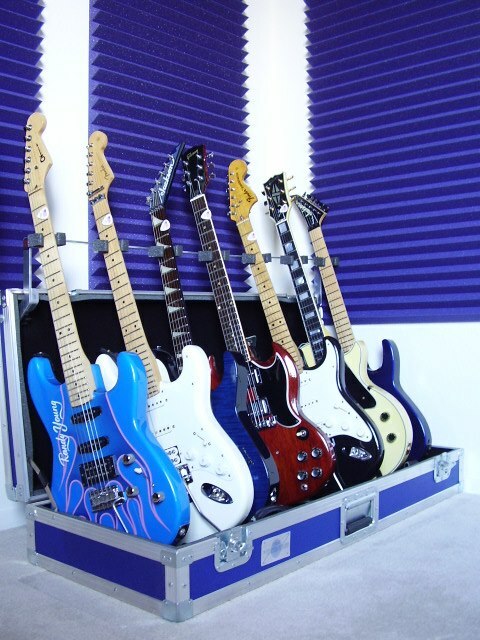 In 1996 Randy first created the Galaxy Guitar Rack System. A professional flight case that hold's 7 guitar's or basses. Randy's vision was to have a guitar company that specialized in a niche market for Hard Rock Guitarists. Now many players from all styles of music purchase guitars from Galaxy. The vision started in 1975, when a teen-aged Randy won best young guitarist in Florida through a contest run by 711 stores and Busch Gardens. A year later Randy met Black Sabbath Guitarist Tony Iommi back stage after a sound check at The West Palm Beach auditorium during Black Sabbath's Sabotage tour. The next year Tony invited Randy down to Criteria Studios in Miami Florida where Black Sabbath were recording their new album Technical Ecstasy. Randy was impressed that Tony uses finger protectors he made to play guitar to over come a finger injury. Tony's fast trills & the time spent in the studio strongly interested Randy to make his own finger protectors. He was influenced by Tony Iommi's heavy left hand percussive pick attack & fast right hand hammer-on's. In 1976 Randy started to make his own finger protectors. After 2 years & many test samples, Randy started to play with them on his finger at show's. Randy played with band's Squadran, Young Thunder, Shockwave then was asked to audition for Kiss & Ozzy Osbourne. Once the internet hit, guitarists with injured fingers saw photos & YouTube videos of Randy using a protector. They requested if he could make them one. With many requests Randy produced some, but only sent them to Musicians with finger injuries. Musicians that truly experienced a severe finger injury searched & now depend on these finger protectors to help them play their instrument again. Randy worked with United States Manufactures to create the Galaxy Ultra-Flex Formula that all Galaxy Protectors & Finger Extensions are now fabricated with. 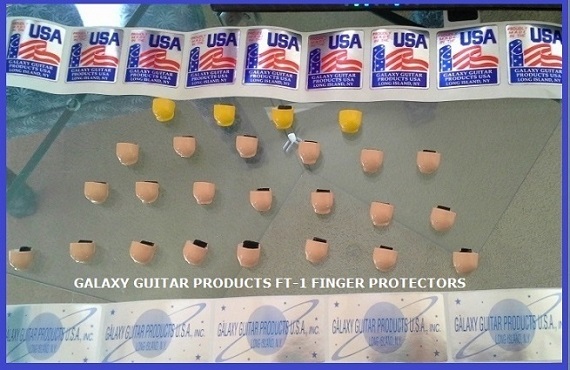 Galaxy Guitar Products USA manufactures the famous tips branded- Galaxy FT-1 Finger Protector™. Many Doctors & Prosthetic companies contact Galaxy Guitar Products to order Galaxy FT-1™ Protectors to help their musician patients who have suffered a severe finger injury or loss of the finger tip. What was a musical & technical obsession for a teen aged Randy Young over time became a mission for Galaxy Guitars USA to help musician's worldwide with injured fingers. Now Bass Players, Violinists, Cellist, Keyboardists, Horn players, Doctors with finger injuries all discovered the Galaxy FT-1™ help's them get back to playing & excelling on their musical journey. The populatrity of these miracle Finger Protectors have exploded to Non Musicans, Wounded Warrior Veterans, Children allowing them to regain the use of their fingers for typing, working & playing an instrument. Galaxy Guitar Products USA also develops unique Guitar's. The Galaxy Trans Starr™ takes the old SG Guitar, advancing technology into the future. Larger body cutaways created more sustain. Galaxy Humbucker wax potted pickup's deliver crushing power chord's & blazing guitar solo's & capture that aggressive pick attack that Randy so much loved from Tony Iommi's style. Another concept that Tony Iommi had on his early SG Guitars were high gloss fret-boards. All Galaxy Guitars have them as well. Galaxy High Gloss fret-board's reduce friction substantially creating smooth vibrato & lightning fast soloing. As Galaxy became popular for discriminating Guitarists worldwide the company was becoming the largest New York Pro Electric Guitar retailer. The NY Pro line offers guitarists the same if not better quality as the large name brand manufactures because the guitars come off the same production lines. Plus Galaxy along with Randy want specific features such as 1957 clear tint finished Maple necks & Fret-boards, Texas Starr single coil pickups that capture the early 70's sound of George Harrison, Jimi Hendrix & Ritchie Blackmore, three more of Randy's favorite Guitarists of that time. The Single coil pickups on our New York Pro Guitars are wax potted and provide more power output without the buzz of standard single coil pickups. Galaxy pre-owned selection, a Guitar collectors dream with unique hard to find Guitars are just a click away. Explore our website, find your Guitar Treasure, Rock The World! Galaxy Guitar Products USA Providing 20 Years Of Excellence. We look forward to serving your musical requirements. Galaxy customers know we take care of them with our great customer service. When you place an order with Galaxy, We track your shipment 24 hours a day. We meet the demands of serious players. If you're playing a club in your home town or you're on the road. Galaxy's professional global customer service is there with our Commitment To Excellence. All Galaxy Guitar's come with a 90 day warranty. 10 years tech support, 10 year's limited parts replacement. Galaxy ships worldwide. We ship our custom guitars 2nd day air in the USA via FedEx Air Express. Galaxy FT-1 & FT-2 Finger Protectors are shipped FedEx as well. International shipments must clear customs in your country. Custom charges that may apply are not covered by Galaxy Guitar Products. If you have questions please consult with us when ordering, we are always here to help you. All orders are verified via email. For Business Inquiries, Sales or Technical Product Questions fill out our Contact Us form. For exisitng Customers email our Client Service's Help Desk. Our International Tel:702-363-5465.